This is a multi-step recipe. Spiced sour cream and taco bowls may be made a day in advance, but other components (taco beef and salsa) are best if made fresh. This recipe makes 6 dinner-size servings. For the Taco Seasoning, you may use reduced-sodium store-bought if you prefer, but it’s simple to make your own with our included recipe. You might also like these Tasty Taco Recipes. 1. Cook beef, onions, green pepper, garlic, and jalapeno in a large (12-inch) non-stick skillet over medium-high heat until beef is no longer pink and vegetables are tender, about 8 minutes. Stir often and break up large pieces of meat as it cooks. Do not drain. Sprinkle taco seasoning over beef, then add broth and ketchup. Mix well. Reduce heat to medium and let mixture cook, uncovered, for 2 minutes. Remove from heat and keep warm. 1. Mix together all ingredients in a small bowl. Cover and refrigerate until ready to use. 1. 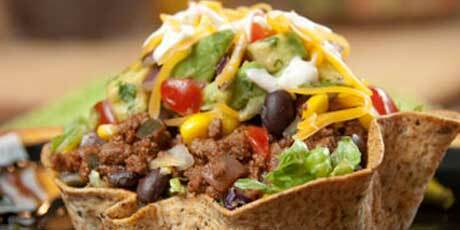 To assemble salad (either individual servings or on a large platter), layer ingredients in the following order: lettuce, hot Taco Beef mixture, corn, black beans, cheese, Spiced Sour Cream drizzle, Chunky Avocado Salsa, cheese, Spiced Sour Cream drizzle. 1. Mix 1 to 2 Tbsp olive oil with ¼ to ½ tsp Taco Seasoning mix. 2. Using a pastry brush, coat both sides of 6 small whole grain tortillas with oil mixture. Press tortillas into deep disposable tin bowls. Bake at 400ºF for 8 minutes. 3. Remove from oven and let cool. Tortillas will crisp as they cool. If not using immediately, cover with plastic wrap and store at room temperature for up to 1 day. 4. Note: Tortillas must be very fresh (soft) in order for this to work. They can be microwaved for a few seconds to soften if necessary. 1. Mix all ingredients together. Makes enough seasoning for this recipe. You may wish to double the recipe and store the leftover seasoning in an air-tight container for future use. Per serving: 587 calories, 18.4 g total fat* (7.5 g saturated fat), 36 g protein, 61 g carbohydrate, 14 g fibre, 83 mg cholesterol, 742 mg sodium. *Much of this fat comes from the heart-healthy avocados! You may use reduced-sodium store-bought taco seasoning if you prefer, but it is simple to make your own! If you’re looking to bring Nordic cuisine to your kitchen, get inspired by these Top Chef Canada-worthy tips and tricks that bring hygge to the plate. Skol!